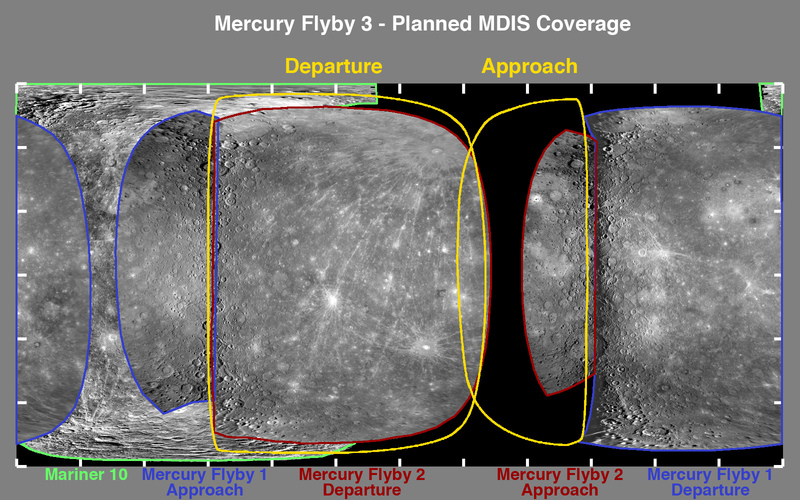 I've just posted a news story containing more detail than most of you probably want on the science plans for the upcoming MESSENGER Mercury flyby, which will happen at 21:55 UTC on September 29. Go read! They're getting tricky with their science planning now. There are two good places to watch real-time simulations of the encounter. As usual, Daniel Muller has a marvelous real-time countdown clock on his website. (Note his site will also have images of the simulated view of Mercury, once JPL's Solar System Simulator is back online. It's currently down but I'm told it should be back up in a couple of days.) And when it gets closer to the most exciting close-approach phase, the MESSENGER Dynamic Visualization Tool will give real-time updates on where MESSENGER's instruments are staring. At present, MESSENGER is doing far-distance of imaging of Mercury, gathering data on its phase curve -- how its brightness and spectral properties change with a change in solar illumination angle. Here's a map showing how MESSENGER will be filling in about 5% more of its imaging coverage during this flyby, leaving only the poles un-imaged. As MESSENGER approaches for its third flyby of Mercury, it will capture images covering the last major swath of the planet not previously imaged by any mission. On its way out, its view will be very similar to the one it had during flyby 2. After the third flyby is completed, only the poles will remain unimaged by MESSENGER. A programming note: Tomorrow there is not one but two press briefings about new space results being published in Friday's edition of Science Magazine. At 11:00 my time there is a televised press briefing about new results from Chandrayaan-1. The rumor mill is spinning violently about this one; evidently there will be some very important news about lunar water. Following that, there will be a media teleconference about some new Mars Reconnaissance Orbiter results featuring scientists from the HiRISE and CTX camera and CRISM spectrometer teams. I will be watching the Moon briefing but will not be able to post about it tomorrow, nor will I be able to listen to the other briefing tomorrow, as I'll be busy at an office function. I will definitely be mentioning some highlights via Twitter, however. I'll plan to have more detailed reports posted on both briefings as soon as I can on Friday. EDIT: Well now Science magazine has lifted its embargo on the water-on-the-Moon news. I'm seeking copies of the three formerly embargoed papers -- can anybody help me out? Science magazine doesn't think I'm a real journalist because The Society is an advocacy organization, not a news organization, so they don't let me have access to the embargoed publications the way they do for most other space writers.